Product categories of LED Candles, we are specialized manufacturers from China, Remote Control Led Candles, Color Changing Led Candle suppliers/factory, wholesale high-quality products of Rechargeable Led Candles R & D and manufacturing, we have the perfect after-sales service and technical support. Look forward to your cooperation! Our Led Candles is made by paraffin wax. LED Candles is for Romantic party, clubs, and celebrations. Led Candles can be divided 2 , rechargeable and battery operated. As to the Rechargeable Led Candles, use method same with phone. first you need to do is to charge it, then switch it on. Battery operated, first of all, put the battery on the bottom of the candle. Then switch it on. Candles also be lit. Rechargeable led candles is more environmental. Battery operated is more easy to bring. Candles can be in one color, such as cold-white, warm-white. Yellow, red, blue, ect. Also can be do in multicoloured. Candle size is also very different. Dia can do 2inches, 3inches, 4inches. Height: 2inches, 3inches, 4inches,5 inches, 6inches....10inchse. 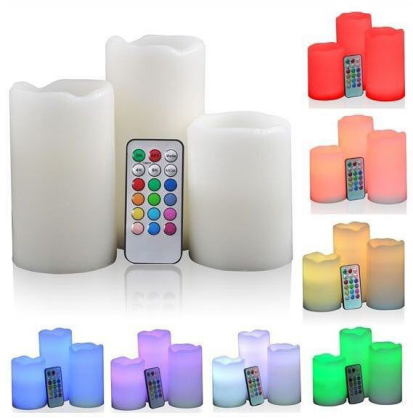 Led candles also have remote, you can choose the remote type. Such as no remote, 2 keys remote:just on&off. 8kyes remote , 10 kyes remote also with 18keys remote. Whatever you need, we can do it. You can also choose the timer: 4 hours, 6 hours, 8hours.